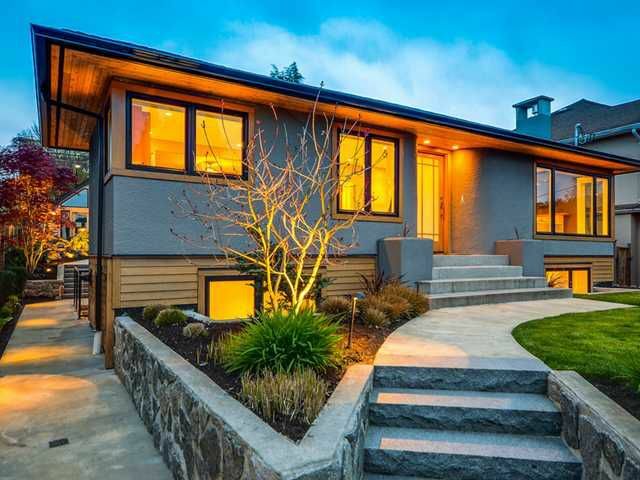 Spectacular home on one of North Vancouver's hidden gems, Lyon Place! This 2 level bungalow was taken back to the studs and professionally renovated to very high standards in 2011. There is an exceptional open concept gourmet kitchen featuring; ss appliances, Silestone counters, glass back splash, custom black walnut cabinets, gas range, built-in wall oven and microwave. The open feel continues through the dining area and flows seamlessly out French doors to a large patio and a professionally manicured yard. Some of the many features of this elegant home include, engineered oak flooring, Grohe fixtures throughout, on demand water heater, heated floors in the bathrooms and mud room , pot lighting, irrigation and much more!